Let me stop right there.. I mean, maybe there were things to feel grateful for, like the nice great salad at one airport and the glazed salmon and broccoli at the next one; like that friendly waiters and the couple kissing at the table next to mine, a good omen always…. I did in fact get stuck next to two unconscious snorers, and they were on the six-hour leg of the flight and me pinned in a window seat. 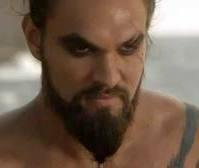 I did in fact get stuck to a giant of a guy who looked exactly like Kahl Drogo from Game of Thrones. Only he weighed 400 pounds such that I was sort of tucked in under his chest the whole time. And he smelled like cheese. A good lesson for me never to write about stuff that hasn’t happened yet.